I’ve been working on this recipe ever since we arrived back from Copenhagen this summer. More specifically, I’ve been working on this one ever since I tasted the dal from Zahida and declared it one of the best things I ate during that trip. Yes, I know. It’s odd. That one of my most memorable meals in the land of Michelin restaurants is a Pakistani dal from an upscale food court. It’s the truth and one I’ve recounted in our travel diary. If you make it to Copenhagen, go here, enjoy this amazing meal and the wonderful service from the chef. If not, then make this recipe instead. I’ll preface this by saying that I wasn’t raised on Indian or Pakistani food. Therefore, like most of my attempts at curries, it’s how I like them to be, not necessarily what’s authentic. I’ve taken quite a few cooking classes around these specialities, but I still adapt them to my style. 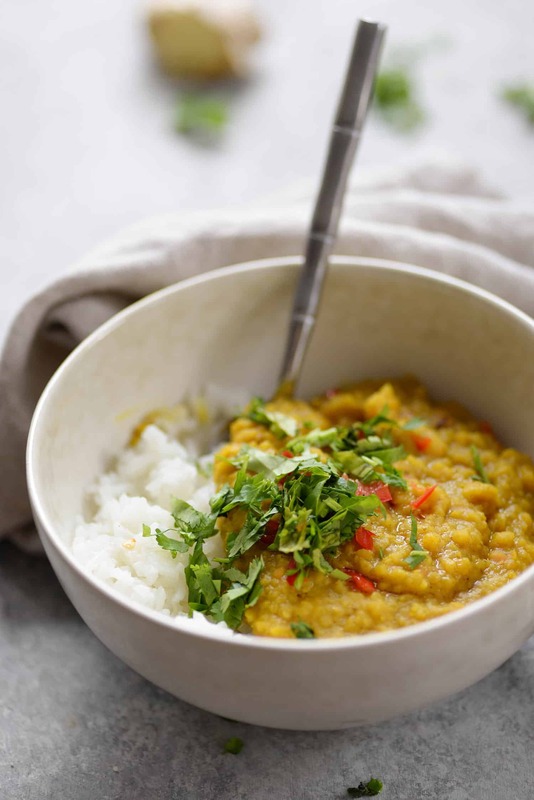 This dal is delicious, but it might not be like the one passed down from your family. If Italian is my favorite cuisine, then Indian food is probably a very, very close second. I think I’m so drawn to its liberal use of spices, vegetables and pulses- three of my favorite foods. I always say that vegetarian food, to me, is some of the most flavorful because we rely so much on layering spices and the varying textures of vegetables. Don’t get me wrong, I love steamed broccoli as much as the next veg-head, but I’m not winning over any skeptics by serving them that. I think that’s where most Americans go wrong; we tend to associate vegetables with being a mediocre side dish or salad instead of the center of attention like it is in many cuisines around the world. Completely plant-based cuisine can be just as complex and delicious as any meat-based recipe. Dried spices usually need to be bloomed first, meaning that they need to be cooked in some type of fat to bring out their flavor. It’s why I usually recommend adding in dried spices when I’m roasting or sautéing vegetables instead of at the end. You need the heat, and the fat, to enhance their rich flavor. For this dish, we are layering the spices in two ways. First, by cooking the lentils in a fragrant, spiced ginger and garlic broth. 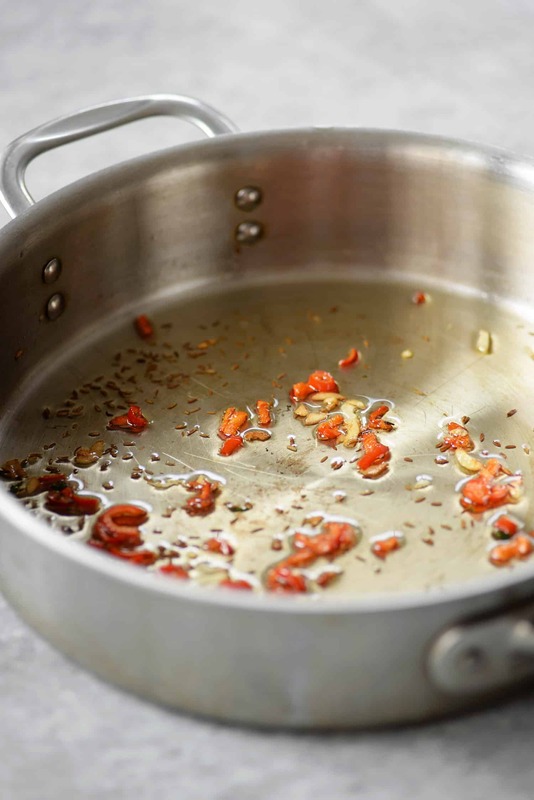 Then, we toast chili peppers, garlic and whole cumin seeds in oil, then drizzle that over the cooked lentil soup. 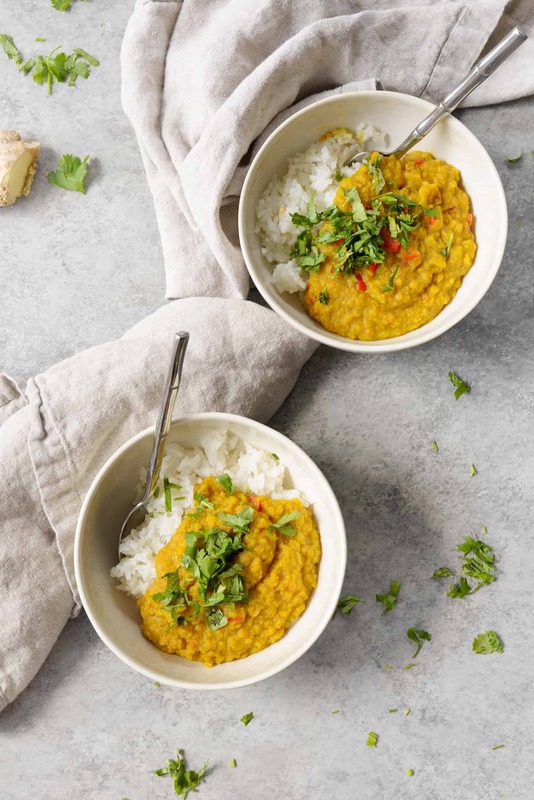 I’m calling for red lentils here, even though I know that the dal I fell in love with in Copenhagen used a mixture of both red and split yellow peas. After heading to three different grocery stores in search of split yellow peas, I gave up. While I could have bought them on Amazon, I knew that if it was that much trouble for me, it would be the same for you. Therefore, we’re using all red lentils instead. If you’re unfamiliar with red lentils, they are much different than their brown and green counterparts. When cooked, they lose their shape almost completely and break down into a thick, silky paste. You can make these as soupy or as hearty as you like by adjusting the amount of water (and therefore salt) that you add. Note that the lentils will thicken the longer they stand. When I’m reheating leftovers, I’ll usually add in more vegetable broth or water. At Zahida, that wonderful little stand where I completely fell for this dish, they served the soup garnished with fresh strips of ginger, sliced fresh chili peppers and lots of cilantro. If you’ve got the time, I encourage you to do the same. Lastly, I love this over cooked basmati rice and a hot piece of naan bread alongside. I’ve spoken about this a few times, but I don’t stress over brown and white rice. You’ve got enough fiber from the lentils to help with digestion and personally, I enjoy the taste of white rice so much more than I do brown. For my spice-addicts, feel free to kick this one up a notch by adding in extra hot chilis, though you’ll want to increase the oil. That’s OK- remember that fat increases absorption of fat-soluble antioxidants like turmeric. When I make this for BL, I almost double the amount of chili and oil. Spicy Red Lentils and Rice! 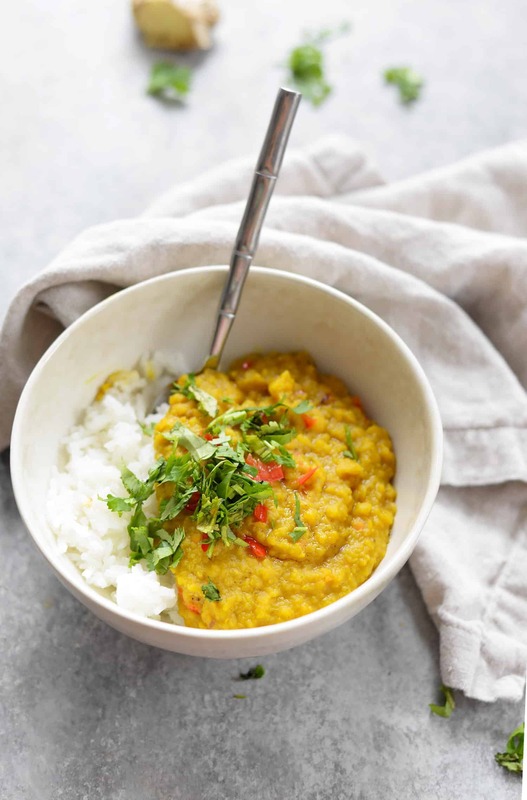 If you love Indian dal, you’ve gotta try this healthy, vegan and gluten-free dish. 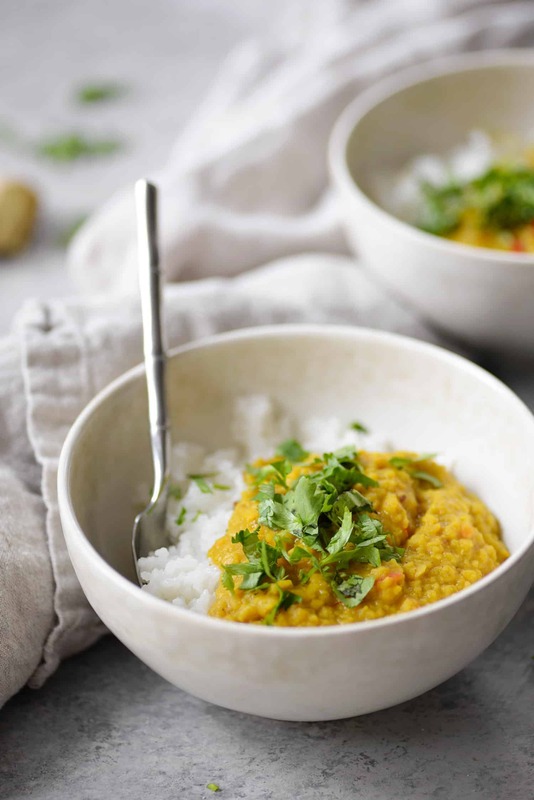 Spiced lentils in a savory curry sauce served with rice. 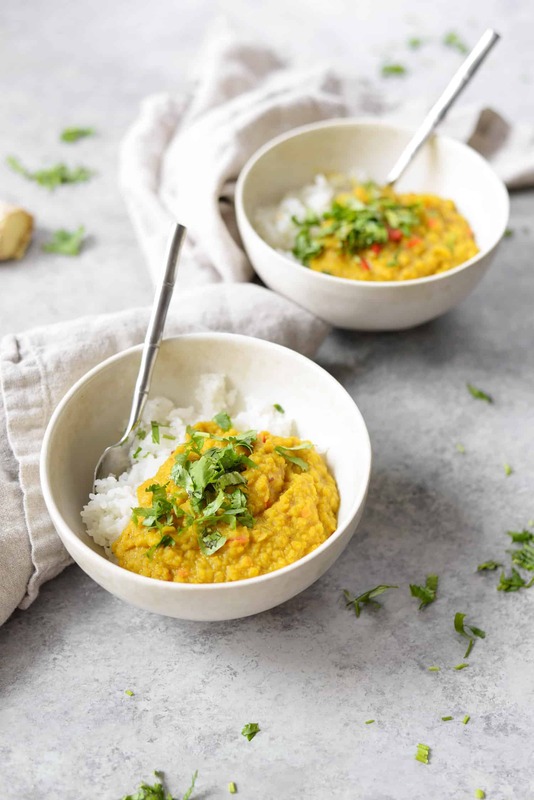 Combine the lentils, 3 1/4 cups water, turmeric, grated ginger, salt and garam masala in a medium saucepan and bring to a boil. 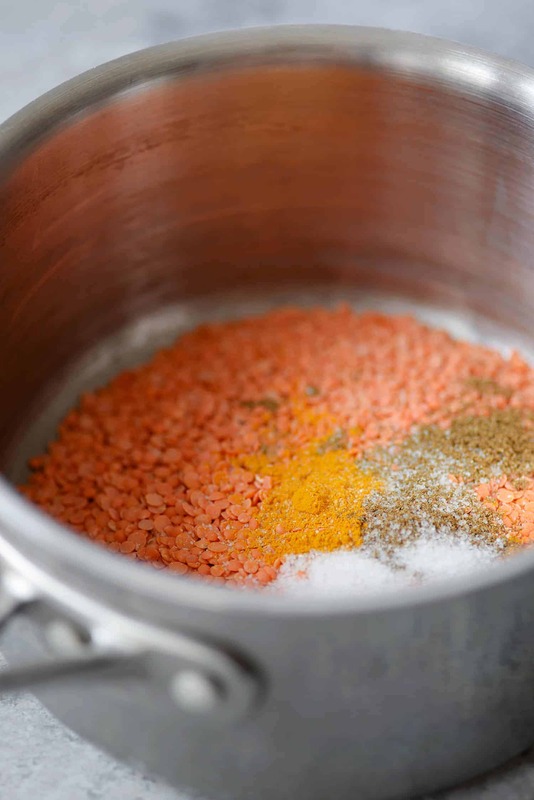 Reduce heat to low and cook for 15-20 minutes until lentils are tender. Stir in the tomato purée. Depending on how soupy you want this, feel free to add in more water. The lentils will thicken as they stand. While the lentils are cooking, cook the rice. About 5 minutes before the lentils are to be ready, heat the canola oil in a small skillet over medium heat. Add the cumin seeds, sliced garlic, sliced ginger and thai red chilis and simmer until garlic is just tender but not browned. Drizzle the heated oil mixture into the lentils and stir together. Season to taste, as needed. Divide rice among 4 bowls and top with lentils. Garnish with cilantro. Thank you for the recipe, but could you verify how much ginger we should use for lentil and for oil? Also, what about tomato pure? It’s one of the ingredient, but where we should use it I don’t understand. Thank you. Thank you for the recipe. If I double the amount of lentils, should I double the amount of spices? Hi Susan- yes, I would double the amount of spices if you double the recipe. It’s what gives it so much flavor!